A truck drivers death from pneumonia is reported in Maui, Hawaii. The Tuscania torpedoing has taken the life of others from Maui, while the plantation manager Weinzheimer is denounced at the Pioneer Sugar Company meeting. The lack of registration by German aliens is reported as a concern to all levels of the government. 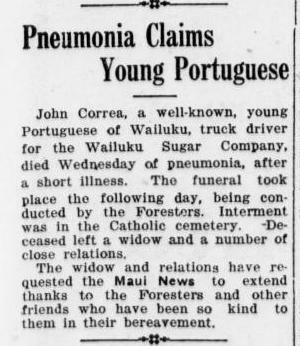 Source: "Pneumonia Claims Young Portugese," Maui News, Wailuku, Hawaii, February 15, 1918. Page 1, Column 1.